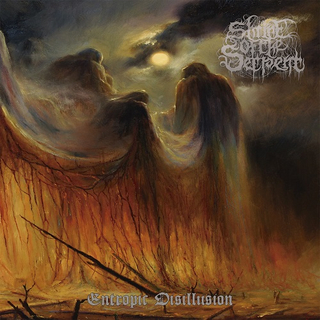 Shrine of the Serpent exhibit mastery of the form on "Entropic Disillusion". Truly and unapologetically Death/Doom Metal to the bitter end, their slowly swirling sound patiently takes its time to entrance and then suffocate the listener, but it sure is fatal, not to mention absurdly heavy, in the most smothering way possible. Dismiss any hope for sentimental melodies, gothic overtones or operatic female voices, for the sole endeavor here is to oppress the listener. Fans of the bleakest approach to the subgenre who hail such bands as early Paradise Lost, Winter, Dusk, Hooded Menace, diSEMBOWELMENT, Loss, Druid Lord and early Cathedral will definitely find plenty of morbid joy from experiencing this concoction of impending death and doom. Completed by Mariusz Lewandowski´s ethereal cover art and a crushing mastering job courtesy of Dan Randall at Mammoth Sound Mastering, "Entropic Disillusion" announces the arrival of Death/Doom Metal´s newest titans: Shrine of the Serpent!